Whoa, it's like a blast from the past! Do you remember your powder blue prom suit? Yeah you do. Your mom was like, "I'm not sure that is going to match her dress," and your dad was like, "You look awesome kid, go get her!" And you did look awesome. It was a great night. Now you have your own kid with the young woman you went to prom with. And you need a suit for him. Your younger sister is getting married, and your son needs to look stylin'. You want something fun, and your wife says it has to be cute. And nothing was more fun (and still cute) than your blue prom tuxedo. You want to find something similar for him. Well, look no further, because we have just the thing for you. 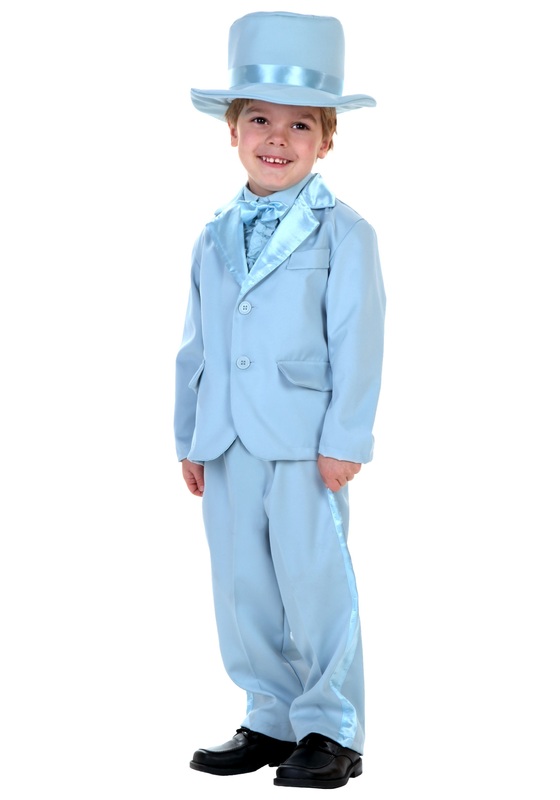 This Toddler Blue Tuxedo will have you reminiscing about how you got the girl at your prom. And it will meet the adorable-ness requirements that your wife has, but honestly you would find it difficult find anything that doesn’t look adorable on your little guy. The hat really tops off the cuteness. And he will be excited that he gets to wear a big boy suit just like all the other guys at the wedding. And all your family will stop you, and tell you how much he looks just like you. "It's like a blast from the past," your mom will say.